At the most recent NATO-Russia Council meeting, Russia and NATO agreed to strengthen their cooperation in the war against terrorism. Talks on the missile defense issue, however, remain at a standstill, with the matter being left up to the presidents of Russia and the United States to decide. NATO–Russia Council (NRC) foreign ministers convened on April 23 in Brussels to approve an expansion in the trust fund to maintain Russian-made helicopters in Afghanistan and announce plans to deepen cooperation between Moscow and NATO in the struggle against terrorism. Specifically, this June, a new bomb-detecting device developed by the Russian Federation and NATO will be tested in the metro system of “one of Europe’s capital cities.” Talks on the missile defense issue, however, remain at a standstill. The talks had been scheduled to last for an hour and a half, but they ended up running an hour longer than anticipated – not surprising, given the agenda. The NRC foreign ministers decided to address nearly all the pressing issues in internationals security – from cooperation in countering terrorism, drug trafficking and piracy, to the escalation of the situation in the Korean Peninsula and the Syrian crisis. No one expected any breakthrough on the Syrian issue. Talks resumed the following day, when the 27 EU Member States (most of which are NATO members) eased the embargo on Syrian oil. Now, European countries will be able to make decisions on supplies of Syrian crude oil from opposition-controlled regions independently. Moscow slammed the decision. Russian Foreign Minister Sergei Lavrov tried to bring the Russian point of view home to NATO: Russia is certain the partial removal of the oil embargo will aggravate the situation in the country, which is already being torn apart by the civil war. The main positive result of the meeting in Brussels was the launch of the second phase of the trust fund to maintain Russian helicopters in Afghanistan. The project, which involves 10 countries, has received about $20 million. This money will be spent on training Afghan engineers and maintaining the Russian-made, Mi-17 helicopters. The second phase of the project envisions a broader training program, with money going toward the maintenance of new types of helicopters – specifically, the Mi-35. The NRC did not confine itself to the Afghanistan program. “The threat of terrorism has not disappeared. 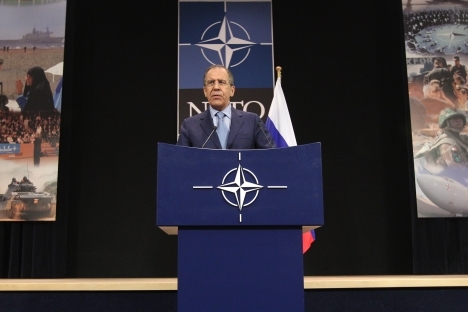 This has been clearly demonstrated by the Boston bombings,” Lavrov said, after which Russia and NATO agreed to strengthen cooperation in this area. In September, the NATO–Russia, joint air-traffic system will conduct a live exercise to defend against terrorist threats to civilian aircraft. In June, Russian and NATO experts will have a live trial of the jointly developed Standex system for identifying bombs. The device, nicknamed the “electronic nose,” will be tested in the metro of a European capital city, the NATO chief said. It was reported previously that the device would be tested in the Paris metro. The system will be used as early as 2014, during the Winter Olympics in Sochi. The NRC members also expressed their concern about virtual security. Lavrov put forward the idea of building up cybersecurity together. “It is crucial for suppressing terrorist networks, hackers and other types of internet crime,” the minister said, adding that U.S. Secretary of State John Kerry backed the idea. Previously, Moscow and Washington were divided on approaches to cybersecurity. No headway was made in talks on the missile defense issue, however. Russia seeks guarantees that no elements of the European missile defense system are aimed at Russian strategic nuclear forces; Washington offers Barack Obama’s personal guarantees to meet Moscow halfway. However, such guarantees are not enough for the Kremlin, which wants agreements that do not depend on the internal political situation in the United States. This NRC meeting was the first one to take place since the United States canceled the fourth, fundamental phase of its Europe-based missile defense project. Because it was this fourth phase that brought on Moscow’s criticism, there were hopes that a new, qualitative breakthrough would be seen in Russia–NATO relations. “We have had active dialogue, but limited progress,” Rasmussen said. Lavrov gave assurances that the Russian authorities were studying the proposals on the missile defense system, which were delivered to the Russian president by U.S. National Security Adviser Tom Donilon, who came to Moscow on April 15. Having made no progress on the missile defense issue, the NRC meeting participants decided to leave the thorny issue for the presidents of Russia and the United States to decide.